FA Gary Slate, Jeff White 1980. A good climb, but pretty dirty. Climb the harder-than-it-looks right-leaning lieback to a handcrack under a golden bulge, then up face left of dirty flakes past an overlap with good thin pro. A bit runout up the face but not too hard. Pitch one anchor replaced 2007, but old rusty bolts higher (5.10c R). 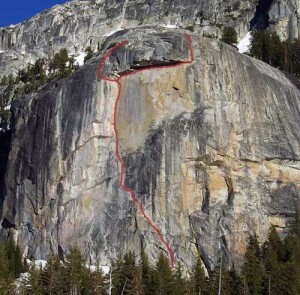 A 100-foot rap down to the right, but just over half a 60m rope straight down, so be very careful with rope ends. 70m rope to lower. Which SuperTopo guidebooks include a topo for Lord of the Overhigh (P1)?